Draft: 2002, Cincinnati Reds, 21st rd. Christopher Anthony Denorfia…resides in Sarasota, Fla., with his wife Lauren…graduated from Choate Rosemary Hall High School (CT)…attended Wheaton College (MA), where he was an NCAA Division III All-American selection in 2002 after hitting .467...inducted into inaugural class of the Wheaton Hall of Fame in 2013…majored in international relations and Hispanic studies…originally signed by Reds' scout John Brickley. Chris split the season between San Diego and Seattle after being traded from the Padres to the Mariners at the trade deadline for outfielder Abraham Almonte and righty Stephen Kohlscheen ...All told, batted .230 (76-for-330) with 12 doubles and three home runs in 121 games (75 starts)...With Seattle batted .195 (16-for-82) with 11 runs, two doubles, one triple, two home runs and five RBI in 32 games ...Batted .242 (60-for-248) with 25 runs, 10 doubles, three triples, one home run and 16 RBI in 89 games with the Padres...Started the season by hitting .309 (38-for-123) in his first 38 games for the Padres from March 30-May 17, but hit just .176 (22-for-125) in his final 51 games prior to being traded at the deadline...In 30 games in the two-hole in the lineup, he batted .288 (30-for-104) with three doubles, two triples and 10 RBI...Between the Padres and Mariners, his teams were 15-2 when he drove in at least one run. Played in a career-high 144 games, also setting career-highs in several offensive categories including hits (132), doubles (21), home runs (10), RBI (47), runs scored (67) and walks (42)…also made a career-high 105 starts (51 in RF, 36 in CF and 18 in LF)...Led the Padres with 132 hits, 67 runs scored and a .279 (132-for-473) average (among all qualified batters)...Batting first in the order, hit .305 (57-for-187) in 43 games, the second-best mark in the leadoff spot among qualifying National Leaguers (min. 150 PA) and fourth-best among all leadoff hitters...Went 11-for-11 in stolen base attempts, one of four players in 2013 to have 10-or-more attempts without a caught stealing (also, Alcides Escobar-KC with 22, Josh Rutledge-COL with 12 and Christian Yelich-MIA with 10)...Recorded a career-high 13 outfield assists, tied with Jay Bruce (CIN) and Bryce Harper (WSH) for third-most among NL outfielders and fifth-most among all outfielders…the most by a Padre since Mark Kotsay also recorded 13 in 2003...Hit .284 (54-for-190) with nine of his 10 home runs against left-handers…hit .276 (78-for-283) against right-handers...With runners in scoring position, hit .293 (34-for-116) and .321 (18-for-56) with runners in scoring position and two outs...On July 29 vs. Cincinnati, had a pinch-hit, walk-off, two-run home run against Reds' closer Aroldis Chapman to give the Padres a 2-1 win, his first career walk-off homer and third career pinch-hit homer…was his third career walk-off hit, and first since also having one against the Reds and Chapman on September 25, 2010…was the 11th pinch-hit, walk-off home run in Padres history and first since Paul McAnulty on September 9, 2006 vs. Colorado...Had a career-long streak of recording multiple-hits in four-straight games from August 14-17...In 75 games at home, hit .301 (75-for-249) while batting .254 (57-for-224) in 69 games on the road...Hit .300-or-better in four of the six calendar months during the regular season: .305 (25-for-82) in April, .310 (27-for-87) in May, .309 (25-for-81) in August and .305 (25-for-82) in 24 games during the month of September...Against NL West opponents, hit .299 (72-for-241) in 72 games, his best average against any National League division...Played for Team Italy in the World Baseball Classic during the Spring...Following the season, was named as the Padres' 2013 Wilson Defensive Player of the Year. Set career-highs in games played (130), batting average (.293), hits (102), doubles (19), triples (six), runs (56) and stolen bases (13)...tied his career-high in RBI (36, 2x, also 2010).His.293(102-for-348)average was second-best among all Padres(no minimum) in 2012.Hit .337 (60-for-178) against left-handed pitching, the 12th-bestqualifying average against left-handers among all NationalLeaguers in 2012 (minimum 125 PA).In 65 games at Petco Park he hit .287 (49-for-171) while hitting.299 (53-for-177) in 65 road games.In the pinch, hit .276 (8-for-29) with five RBI...is a career .289(24-for-83) pinch-hitter.With the bases loaded, was 2-for-6 (.333) in 2012...is a career .458 (11-for-24) hitter with the bases loaded.Had a career-best 12-game hitting streak from 6/6-25, hitting .370 (17-for-46) over that streak...tied for the longestby a Padre in 2012 (also, Chase Headley, 6/26-7/7)...also had an 11-game hitting streak from 8/24-9/10, hitting.415 (17-for-41) over that span, the second-longest hit streak of his career.Hit three leadoff home runs in 2012 on 7/7 vs. CIN, 8/12 at PIT and 9/4 at LAD...five career total leadoff homers(also, 5/11/11 at MIL and 6/14/11 at COL).On 4/11 vs. ARI, hit a game-winning two-run homer in the eighth inning to give the Padres a 2-1 victory, their secondvictory of the season.Made a career-high 77 starts, including 60 in RF, 13 in LF and four in CF...started 45 games batting leadoff, hitting.303 (57-for-188) when in the No. 1 spot of the lineup.Agreed to terms on a two-year contract extension through 2014 on 9/5. Set career highs in games played, hits, and stolen bases in his second year with the Padres..tied a career high by making 72 starts, including 52 in right field, 11 in left field and nine in center field ... Missed time while on the disabled list from 8/6-9/5 with a strained left hamstring...made rehab appearances with Single-A Lake Elsinore and Triple-A Tucson ... Hit .328 (39-for-119) against left-handed pitching, ranking ninth in the NL among qualifying batters ... Connected for the first two leadoff home runs of his career, 5/11 at MIL and 6/14 at COL ... Stole home on 7/25 at PHI, the first steal of home by a Padre since Mark Sweeney on 7/6/05 at HOU...the first "straight steal" of home for San Diego since Eric Owens on 5/21/99 vs. CIN ... Went 8-for-22 as a pinch-hitter, tying for third among all qualifying pinch-hitters with a .364 average. Began the season with Triple-A Portland...had hiscontract selected by the Padres on 5/17 and spent the rest ofthe season in the Majors, making 72 starts in the outfield...Made 44 starts in center field, 15 in left field and 13 in right field...despite making just 15 starts there, he appeared in 44 games in leftfield for the Padres...Padres went 42-30 (.583) in his 72 starts...Hit .282 (49-for-174) with a .347 on-base percentage and .489slugging percentage in 58 games after the All-Star break...Connected for his first career inside-the-park home run 8/5 at LAD...third ITP homer by a Padre in 2010 (Gwynn - 2)...Started in six different spots in the lineup throughout the season, spending the majority of the season hitting seventh (24starts) and eighth (21 starts)...Hit .306 (37-for-121) for Portland, including a .367 clip (11-for-30) against left-handers and a .373 average (22-for-59)at home...Started the season by hitting .431 (19-for-44) over his first 13 games for the Beavers...had hit safely in eight of his lastnine games at the time his contract was selected from Portland. Spent the entire season at Sacramento with the exception of a four-game stint with Oakland inJune.Recalled by the A's 6/9...appeared in one game in all three outfield positions and also pinch-ran once...did not start a gameand was optioned back to Sacramento 6/18...Finished second on the River Cats in hits (117) and triples (5)...hit .283 (86 for 304) with all nine of his home runs and 42of his 49 RBI against right-handed pitching and .242 (31 for 128) against lefthanders...Hit .232 at home and .303 on the road...Appeared in 46 games in left field, 35 in center field and 21 in right field...Missed part of Spring Training while playing for Italy in the World Baseball Classic...batted a team-leading .400 (4-for-10)with three doubles, two RBI, two walks and two runs scored in three WBC games...Placed on the disabled list 5/4 with a strained right hamstring...reinstated 5/20 and reached base safely via hit or walk ineach of his first 18 games following his return. Split his time in 2008 between Oakland, the disabled list and Triple-A Sacramento...was on the A's Opening DayRoster and batted .260 in 25 games before going on the disabled list on May 11 retroactive to May 7 with lowerback tightness...missed a total of 61 games before he was reinstated from the DL on July 19 and optioned toSacramento...batted .302 with two home runs and 20 RBI in 45 games overall with the River Cats...returned toOakland on September 17 and went 5 for 12 (.417) with a home run and three RBI in four games to finish theOakland portion of his campaign with a .290 batting average in 29 games...hit .333 (11 for 33) with his lone homerun and six of his nine RBI against right-handed pitching compared to .241 (7 for 29) against left-handers...batted.241 with the bases empty and .333 with runners on, including .350 with runners in scoring position...had a .138career average with RISP entering the season...hit .286 with two strikes...started 16 games for the A's, includingeight in center field, seven in left field and one in right field...did not commit an error in 24 games total in the outfield(38 total chances). Acquired by the A's from the Reds for two players to be named later and cash considerations 4/27...spent the entire year on the disabled list...Underwent "Tommy John" surgery on his right elbow 4/3...tore the ulnar collateral ligament in his right elbow during a SpringTraining game with the Reds 3/23...placed on the Reds disabled list 3/24 and transferred to the 60-day DL 4/13. Split his season between Triple-A Louisville and Cincinnati, making four stints with the Big Leagueclub...Made 25 Major League starts (14 in RF, 10 in CF, 1 in LF)...Spent the majority of the season with Louisville, hitting .349 in 83 games...fell 29 plate appearances shy of qualifying forthe International League batting title...Louisville's only player selected to participate in the Triple-A All-Star Game...Rated by Baseball America as the best defensive outfielder and batter with the best strike zone judgment in the InternationalLeague. Spent the majority of the season between Double-A Chattanooga and Triple-A Louisville, eventuallymaking his Major League debut with the Reds in September...Received the Sheldon Bender Award as Cincinnati's Minor League Player of the Year...combined to hit .317 with 20 homeruns, 87 RBI and 12 stolen bases in 137 games...Promoted to the Majors 9/5 and made his Big League debut 9/7, striking out as a pinch-hitter...first career hit came in hissecond plate appearances, knocking a solo homer 9/9 off Pittsburgh's Oliver Perez...Named Louisville's Hitter of the Month for June, batting .337 with six home runs and 26 RBI. Split his time between Single-A Potomac and Double-A Chattanooga...Combined to hit .284 with 17 home runs, 78 RBI and 15 stolen bases...Among all Reds minor leaguers, he ranked tied for fourth in both home runs and RBI...Began the season at Potomac and was selected to play in the Carolina League vs. California League All-Star Game...namedthe Carolina League's Batter of the Week for 4/26-5/2...Promoted to Chattanooga 7/1. Spent the season at Single-A Potomac and hit .236 with four home runs and 39 RBI in 128 games...Ranked fifth in the Carolina League in strikeouts (105)All defensive appearances came in centerfield, where he had 15 assists...Tallied four four-hit games. Made his professional debut with the Rookie-level GCL Reds...also appeared with Single-A Daytonand Double-A Chattanooga...Ranked among GCL leaders in on-base percentage (2nd, .425), batting average (3rd, .340), walks (4th 31), hits (T4th, 68)and runs scored (T4th, 38). June 1, 2017 Albuquerque Isotopes released OF Chris Denorfia. May 4, 2017 Albuquerque Isotopes placed OF Chris Denorfia on the 7-day disabled list. February 2, 2017 OF Chris Denorfia assigned to Albuquerque Isotopes. 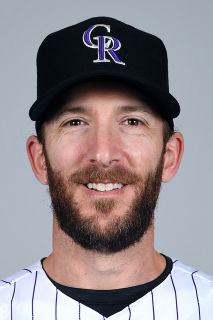 January 13, 2017 Colorado Rockies signed free agent OF Chris Denorfia to a minor league contract and invited him to spring training. August 15, 2016 Sacramento River Cats released OF Chris Denorfia. June 30, 2016 Sacramento River Cats activated OF Chris Denorfia from the 7-day disabled list. June 20, 2016 Sacramento River Cats sent OF Chris Denorfia on a rehab assignment to AZL Giants. June 16, 2016 OF Chris Denorfia assigned to Sacramento River Cats. June 10, 2016 San Francisco Giants signed free agent LF Chris Denorfia to a minor league contract. March 27, 2016 New York Yankees released LF Chris Denorfia. March 2, 2016 New York Yankees signed free agent LF Chris Denorfia to a minor league contract and invited him to spring training. March 2, 2016 LF Chris Denorfia assigned to Scranton/Wilkes-Barre RailRiders. November 2, 2015 LF Chris Denorfia elected free agency. June 7, 2015 Chicago Cubs activated LF Chris Denorfia from the 15-day disabled list. June 4, 2015 Chicago Cubs sent OF Chris Denorfia on a rehab assignment to Tennessee Smokies. May 5, 2015 Chicago Cubs placed LF Chris Denorfia on the 15-day disabled list. Strained left hamstring. April 17, 2015 Chicago Cubs activated LF Chris Denorfia from the 15-day disabled list. April 12, 2015 Chicago Cubs sent OF Chris Denorfia on a rehab assignment to Myrtle Beach Pelicans. April 5, 2015 Chicago Cubs placed RF Chris Denorfia on the 15-day disabled list retroactive to March 27, 2015. Mild left hamstring strain. January 9, 2015 Chicago Cubs signed free agent RF Chris Denorfia. October 30, 2014 RF Chris Denorfia elected free agency. August 1, 2014 Seattle Mariners activated RF Chris Denorfia. July 31, 2014 San Diego Padres traded RF Chris Denorfia to Seattle Mariners for CF Abraham Almonte and RHP Stephen Kohlscheen. September 5, 2011 San Diego Padres activated RF Chris Denorfia from the 15-day disabled list. September 2, 2011 sent RF Chris Denorfia on a rehab assignment to Tucson Padres. August 31, 2011 Tucson Padres sent RF Chris Denorfia on a rehab assignment to Lake Elsinore Storm. August 14, 2011 Chris Denorfia assigned to Tucson Padres. August 6, 2011 Chris Denorfia roster status changed by San Diego Padres. August 4, 2011 San Diego Padres placed RF Chris Denorfia on the 15-day disabled list. May 17, 2010 San Diego Padres selected the contract of RF Chris Denorfia from Portland Beavers. April 5, 2010 Chris Denorfia assigned to Portland Beavers. December 18, 2009 San Diego Padres signed free agent LF Chris Denorfia to a minor league contract and invited him to spring training. November 9, 2009 Oakland Athletics sent Chris Denorfia outright to Sacramento River Cats. October 19, 2009 Chris Denorfia roster status changed by Oakland Athletics. October 9, 2009 OF Chris Denorfia assigned to Aguilas del Zulia. June 18, 2009 Oakland Athletics optioned Chris Denorfia to Sacramento River Cats. June 9, 2009 Oakland Athletics recalled Chris Denorfia from Sacramento River Cats. May 21, 2009 Chris Denorfia roster status changed by Sacramento River Cats. May 4, 2009 Sacramento River Cats placed OF Chris Denorfia on the 7-day disabled list.